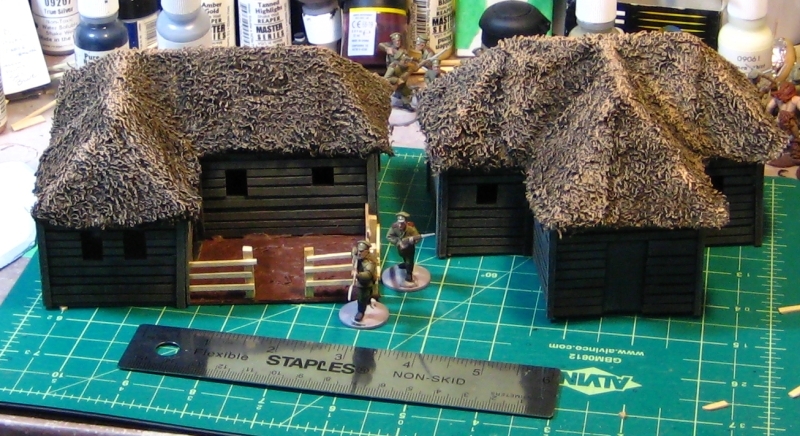 A few people on the Lead Adventure Forum and elsewhere have asked how the thatch on my various Russian buildings was done, and I”ve been promising some in-progress photos. I got those shot last month, and finally sat down to edit the pictures and write this tutorial. The basic materials are mattboard (good-quality picture framing card, used for most of the underlying roof structure), light card (used to bridge the spaces between the mattboard pieces and support the towel) and a cheap hand towel I picked up at the nearby dollar store, for the actual thatch. The roofs pictured below are more complex than many, first because they’re hipped roofs, with all four sides sloping inward, and second because both buildings I happened to be building while I took these pictures have a complex floorplan, one T-shaped and the other L-shaped. I’ll discuss some of the peculiarities of doing towel thatch over a hipped roof in a bit. I also design most of my roofs to be removable, which complicates design of the underlying structure. All that aside, the basic towel thatching technique is going to be basically the same for a simple gable roof permanently attached to a building or a complex removable roof like I’m doing here! The roof structure - about as complex as a model roof is ever hopefully going to get! Above, the main structure of mattboard, with light card over some of the bigger gaps in strips. I don’t bother trying to cover the whole roof, the towel is more than strong enough to support itself once all the glue on it is dry. A simple gabled roof with one ridgeline is obviously going to be a lot simpler! Towel being glued down, cut oversized so it hangs well over the eves. 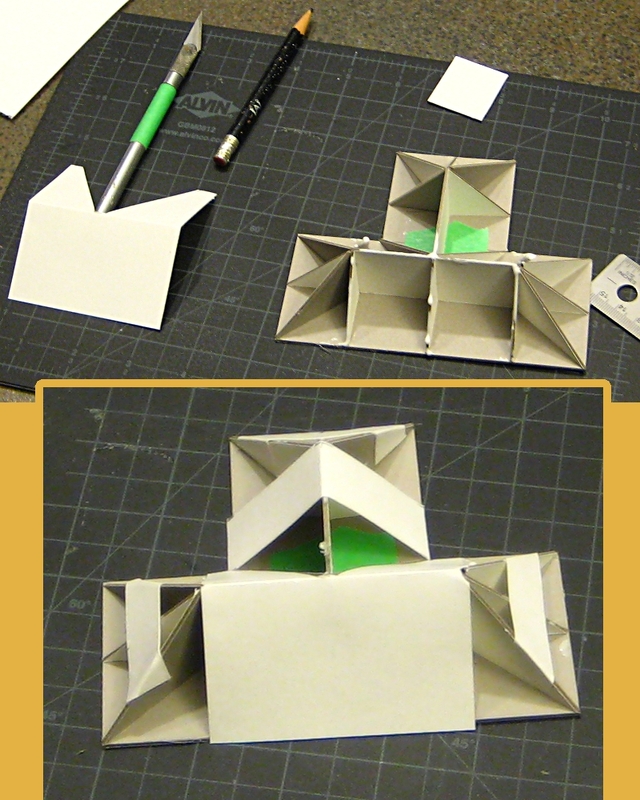 On this T-shaped roof, I started the sheet of towel on the top of the T, after putting glue over the card and along the edges of the mattboard pieces, then folded it over the main ridgeline and across the ends. I cut the towel on the hip roof ends and in the valley where the stem of the T goes out, and in several places removed triangles of towel to avoid having multiple layers of fabric piled up. The cut edges got an extra smear of white glue worked into them with a fingertip, to secure and help disguise the edge. 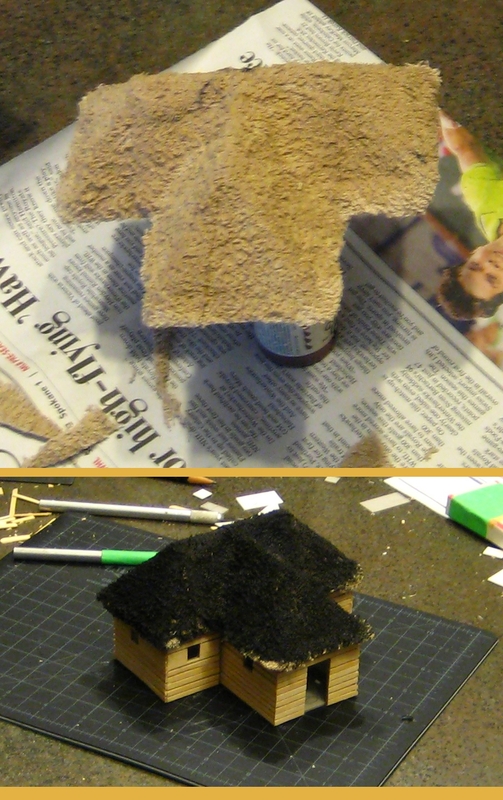 For these roofs, because they were complex enough already, I’ve gone with a single layer of towel, but you can get a nice extra effect by starting with strips of towel, and gluing them up from the eve toward the ridge of the roof in slightly overlapping stips. Real thatch is often laid in layers, and this recreates the look nicely. See my older English Civil War barn article for an example of thatch with strips of towel. An illustrated explanation of how to fit towelling around a hipped roof's ends. With scissors, cut upward from the eve to the end of the ridge, removing a triangle of towel, then glue the ends over each other with an extra smear of glue to hide the edges. The photo above should explain how to fit the towel around the sloped ends of a hipped roof, removing triangles of towel to avoid having massive amounts of overlapping fabric. After the towel has been fitted to the roof, leave the whole thing to dry for a while. Note that the towel is hanging well over the eves at this point, and to keep that fabric from being glued to the table, I’ve propped the whole roof up on a couple of bottles of craft paint. I don’t use the building itself, because I want these roofs to be removable and the next step could easily glue my roofs down to the building by accident! That’s because the next step is to saturate the towel with dilute white glue. I mix a jar of roughly two parts water to one part white glue, well mixed, then apply it liberally with a big paintbrush, a 1.5″ household brush I use for all sorts of scenery painting. You might think a soaking in watery glue would wreck or warp the underlying cardboard structure, but I’ve done four buildings this way in the last few months and none have warped noticeably. Remember that you are dealing with towel. It will soak up your glue-water mix like, well, towel. Dab gently with the paintbrush, you don’t want to push the towel around or wrinkle it. After it’s well painted with your glue-water mix, leave the roof in a warm place at least overnight to dry. After your roof dries overnight, the glue-soaked towel is basically strong enough to stand up on it’s own. Now you can trim the eves back accurately with scissors, making sure to fit the roof to the building (if it’s removable like mine are) to get a good fit and ensure the eves look good and even. After that, basecoat with a dark colour, I go straight for black, and mix a bit more white glue into the paint to further strengthen the roof. This is also your chance to trim or re-glue any seams or areas you missed during initial construction. You could skip some of this by just starting with a black or dark brown towel — I started with tan as that was the least-objectionable colour the cheap towel I use came in. After the black basecoat is finished, I do two drybrush coats to bring the texture of the towel out and make it look like tatch. 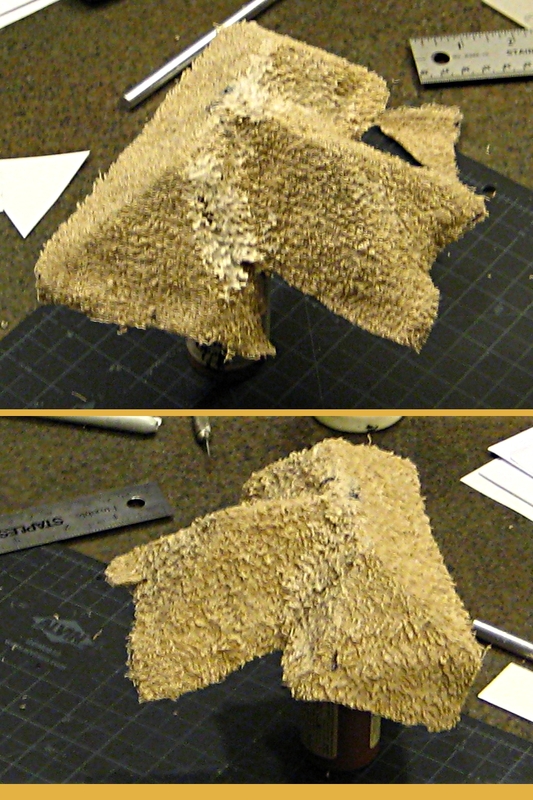 The first, fairly heavy drybrush is with a 1:1 mix of light brown and grey paint; the second drybrush is brighter, more tan or light brown and less grey in the mix, and i concentrate on the ridgelines of the roof, to make the shape “pop” a bit. You could do more of a straw/yellow colour to your thatch, but real thatch almost always weathers to a grey/brown/black colour fairly quickly. From left to right, a finished building, with thatch painted as described in the text. Centre, unpainted but with eves trimmed. Right, black basecoat only on the thatch, awaiting it's two drybrush coats. Finally, a photo from my earlier posting about the two buildings featured in this article, with everything finished except the fence on the L-shaped building. You can see the drybrushed finish that brings out the texture on the towel, and the slight highlighting of the ridges and edges of the roofs. A pair of new, larger Russian-style buildings for our 28mm RCW games. Click for larger. Hopefully this helps someone out there tackle their own thatch roof from towel. Remember that the roofs I’ve used as illustration for this article are at about the outer limit of complexity for a thatch roof, being hipped, T- or L-shaped and removable all at once! A simple gable roof can just use a single strip of towel, up one side and down the other; this gets even easier if you build permanent roofs instead of removable ones. 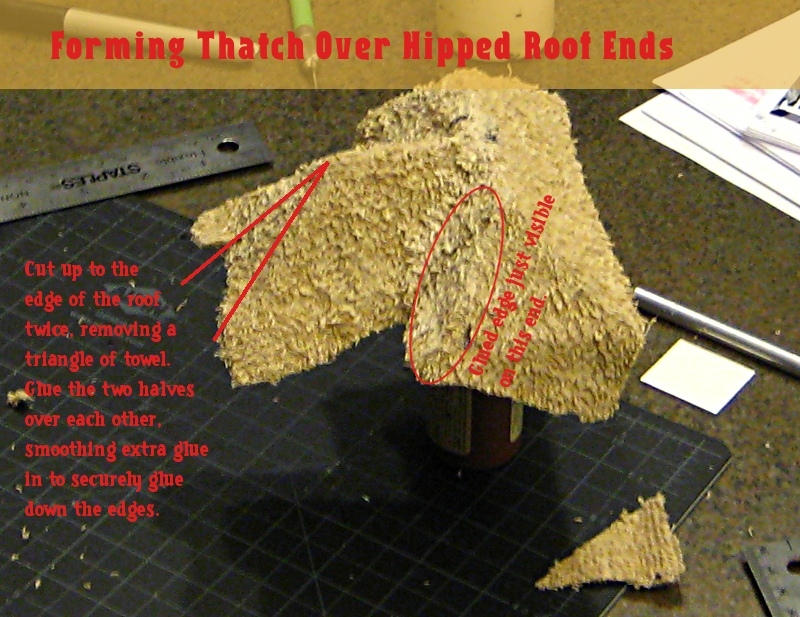 Richard Clarke of TooFatLardies has an interesting article on using putty for thatch, if you don’t want to try towel. I’ll have to give that a shot on the next small building I do, although I think towel is easier and more economical on larger buildings. Any comments, suggestions or questions, fire them into the comments below and I”ll do my best to respond.